On July 29, 2012 I had the distinct pleasure of going to Heritage Gardens with Dawn and Eric Pauli to shoot Eric’s graduation pictures. It was a beautiful day! Two hours, about 5 outfit changes, a quick cleaning of Natalie’s wheel well and we were done! The time flew by! We laughed, we joked, and of course Dawn and I teased Eric about his obsession with his clothes, car and hair. As I sit here now typing this blog I never would have imagined that looking back through those pictures and thinking about all the fun we had could be so bittersweet. You see, today would have been Eric’s 21st birthday. I say would have because Eric was killed tragically on February 2, 2014 in a snowmobile accident. 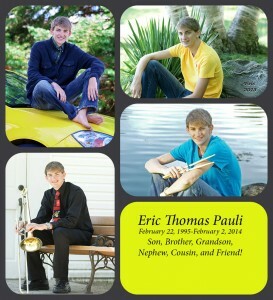 Eric loved his yellow Pontiac G6. Her name was Natalie. In fact Eric loved the car and the color yellow so much that he and Jeffrey took apart and painted the inside yellow. I think the two of them worked for two days on Natalie. If only the two of them spent that much time and effort on schoolwork, but that’s another story! The LAN parties they would have always made me chuckle. A group of teenage boys sitting together in one room with their computers gaming was quite a sight. No, they did not have laptops. They would haul the CPUs and the monitors and all the cables and set up for one night. The last time Eric was at my house was at the LAN party the day after Christmas. I gave him grief because he came in carrying a CPU that was huge! He barely made it down the stairs. The next morning I woke up and found him sleeping on the couch in the front room. That was the last time I saw Eric. Now I look back through all the pictures we took that day back on July 29, 2012 and feel blessed to have made such precious memories. Eric was so full of life, and when I look back at the pictures I truly hope it’s what others see as well. Eric’s parents have set up a scholarship fund in his name at Oakland University. Please click on the link below to view the article and learn how you can donate and keep his memory alive. 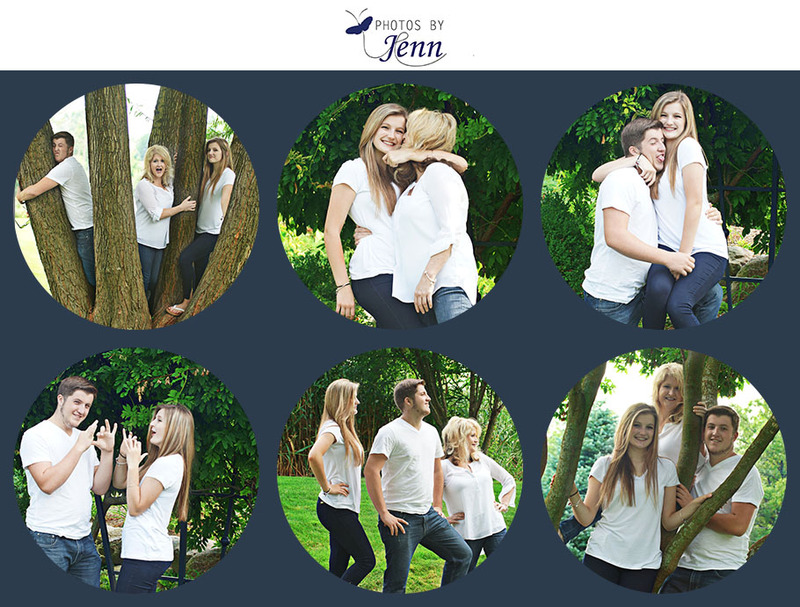 On August 28, 2015 I had the pleasure of taking family pictures with the McVicars: Andrea, Alex, and Elizabeth. This session was extra special because I have known Andrea since before Alex and Bea were born, and I have watched Alex and Bea grow up, as they both went to Erie. The day was beautiful and the pictures are great, but what you don’t get to see is all the fun we had, and how much we laughed. I was able to capture a couple of the playful moments between the family and thought I would share a few of those moments with you. So, thank you McVicar family for sharing your time with me and allowing me to capture some special memories. To see more of the serious side of the photo shoot click here. On Sunday, August 9th I had the opportunity to photograph the wonderful Kirsch family at Stony Creek Metro Park. Ryan, Amanda and Sebastian were a lot of fun to photograph. Not only are they a fun family to work with, they are also a beautiful family to photograph. It did not take long, however, to see who gets all the attention in this family. Sebastian will be starting preschool this fall and I am sure he will keep his teachers as entertained as I was. When he wasn’t hamming it up for the camera he was busy “shaking his tail feathers” to make mom and dad laugh. When you have such a handsome young man entertaining the group you increase the shutter speed on the camera and keep clicking away. There is nothing more rewarding than catching all of the antics on camera, especially the facial expressions. Below is just a sample. 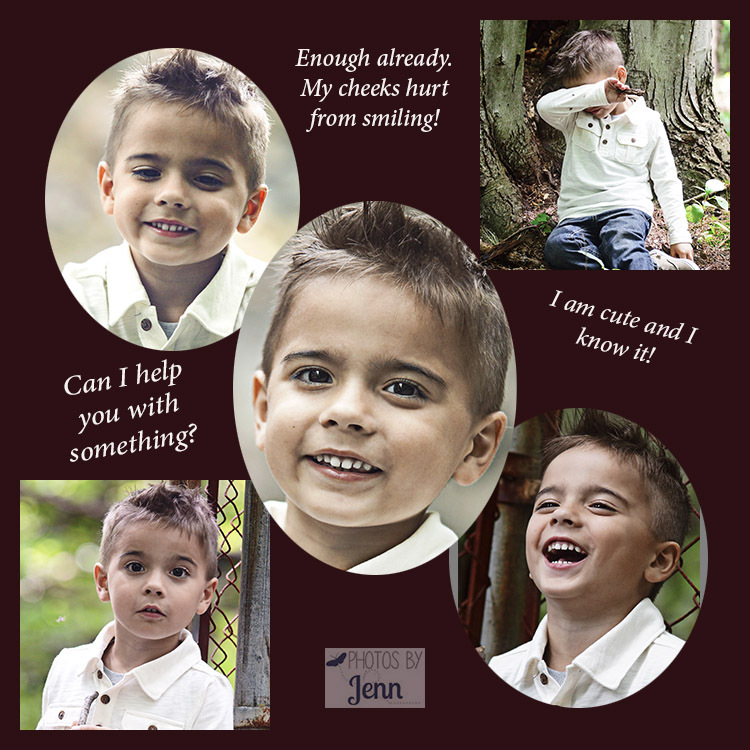 If you want to see more of Sebastian or the family please click here. A Great Time to go to the Zoo! As I begin my journey into blogging I was having trouble deciding on what to write about, as my journey into a career in photography is also just beginning. Scrolling through Facebook gave me my first idea. I have noticed that the zoo seems to be a popular destination right now. After all, the kids are still out of school, so what a better way to spend the day than at the fabulous Detroit Zoo. It’s a great way to spend a summer day; however, as the weather gets warmer, even hot, the animals want what we all want in the heat: to lay in the shade and stay cool. On hot summer days the animals tend to laze around and people watch, probably wondering why the humans stand around and sweat waiting for them to romp and play. So, as you walk along the lovely path from one enclosure to the next, you strain to see the animals as they hide in the back in a shady spot. This has been my experience on many trips to the zoo. Even when I’ve gone to Animal Kingdom my family would head right to the safari ride as soon as the park opened, as it was cooler in the mornings and we had a better chance of seeing the animals moving around. 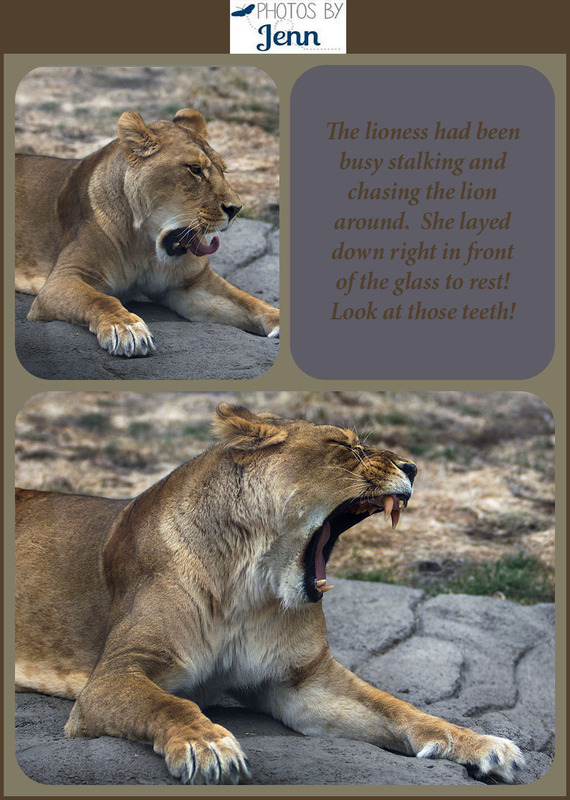 It wasn’t until I was taking the travel photography class at Macomb that I myself actually went to the zoo at a time when you would normally not think about going, the beginning of March. It was a bit chilly, but there are many places to warm up. You also tend to get the docents all to yourself because the zoo is practically empty. As you walk through the zoo you notice a difference in the animals when the weather is colder. They are not hiding trying to stay cool. They are more active and are more fun to watch. As a first grade teacher I took my class to the zoo every year for many years. Not once, on all those trips, did I see what I did this day in March. 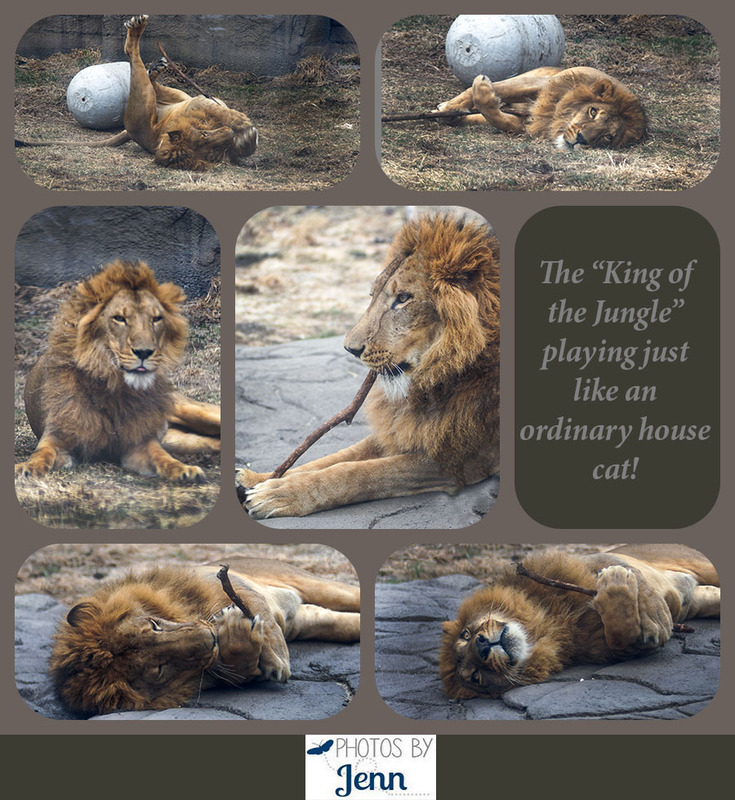 The lion, “The King of the Jungle,” was playing and romping with a large stick just like an ordinary house cat. It was not the usual sleeping lion, as I had seen every other time I had gone. Not on this chilly day. It was fantastic and I was lucky enough to have my camera out and ready to capture something I had never seen before. So I urge you, especially if you want some really cool pictures, to go to the zoo when the weather is a little chilly. In November before the snow falls, and in March when most of the bitter cold is behind us. You may get lucky and see this big guy rolling around and playing with his stick. Make sure your camera is ready! Enter your email address to subscribe to photos by Jenn blog.